You probably need a vacation. Most of America does. Between 1976 and 2000, the average worker took roughly 20 vacation days annually, according to data from Project: Time Off. But as the economy buckled in 2008, so did our desire to flock to the beach, and in 2015, the number plunged nearly a full week lower, translating to 658 million unused vacation days. Much of this is by choice: That same year, 55 percent of Americans left vacation days on the table, preferring to stay in the office than do, quite literally, anything else in the world. Why are we shackled to our laptops? This vacation gap has roots in the Great Recession, it has a steep (and hidden) cost to employees — and it’s something that, if not addressed, can sap a company of its potential for growth. Luckily, there’s a fix. 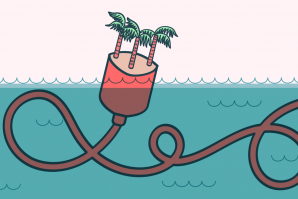 Many employees, with or without a backup, fear the crushing amount of work that will greet them when they return so that even the idea of a vacation is stressful, according to Gina Dokko, an associate professor at the UC Davis Graduate School of Management. How can you relax if you know that for every hour you nap by the pool, you’ll later spend an extra hour in Excel? But the real toll is harder to calculate, because it’s more difficult to get hard numbers on the cost of employee burnout. There’s an old fable about a lumberjack hurrying to chop a large stack of wood. He doesn’t want to waste time sharpening his saw, so the saw gets dull and the task takes him even longer. 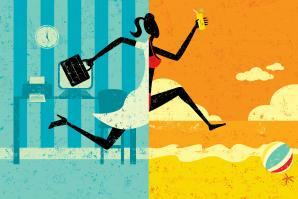 “Vacations reduce stress. They improve human relations. They improve performance. They reduce illness,” Glassman says. “And they improve relationships away from the office; that’s the big one. When things are going well at home, you’re a better contributor at work. Ernst & Young once conducted an internal study, finding a clear correlation between vacation time and job performance: For every additional 10 hours of vacation time, year-end performance evaluations spiked by 8 percent, presumably because the employees are recharged, fresher and more engaged. Taking more vacation could even give you a higher salary. “Employees who take 10 or less days of vacation time are less likely to have received a raise or bonus in the last three years than those who took 11 days or more,” according to PTO. To help nudge employees to actually use their vacation days, some companies implement a “use-it-or-lose-it” policy. However, according to Glassman, for many companies, the strategy flops. “Since employees thought it would be more stressful to get away, they said, ‘I’d rather just lose it,’” he says. Other companies, such as Workday, the financial management firm, are testing the idea of unlimited vacation days, where employees can disconnect as often as they want — as long as the work gets done. This sounds great in theory, but it’s not enough to combat the other factors at play, because deadlines still need to be met. The staffing agency The Creative Group conducted a survey and found that 56 percent of workers — and a whopping 72 percent of executives — would not take a single extra day off even if they had unlimited vacation. According to the HR experts, true change will come not from tweaking the official company policy but a real shift in the culture — and that starts at the top. “CEOs and senior management have a responsibility to send a message down the line and stick with it,” Dokko says. It’s only human nature: We tend to be influenced by the cues from our bosses, not from the fine print on page 37 of our HR packet. PTO found that 80 percent of employees said that if they felt “fully supported and encouraged by their boss,” they would take more vacation days. The onus is not just on the company. Dokko says workers also need to get better at advocating for themselves. “Employees need an attitude adjustment. They are entitled to their vacation,” she says. And there’s one very simple, concrete thing that all of us can do to take more vacation: Plan it. Project: Time Off found that when employees plan their vacations in advance, they are far more likely to actually take them: 51 percent of people surveyed who planned ahead used all of their vacation time, while only 39 percent of non-planners did. It makes sense: When you have that summer trip to Iceland already on the books, you’ll somehow find ways to make it happen. As scary as that can seem in the short-term, this has a long-term benefit for you, your relationships, your company and the economy as a whole. So put down this article and go plan a vacation. Great article and relevant to our company.